On one of the days we were in Washington, Josh's Aunt & Uncle invited us over for dinner with the cousins, grandparent and great grandparents. Josh's aunt and uncle have an AMAZING backyard. They have a HUGE Koi Pond and frogs galore! Once we were done with dinner the kids spent time by the pond and Hailey wasn't far behind. Hailey's grandma took her over and let her be by her cousins to watch and feed the fish. Another special person that joined us was Granny's Aunt Grace! Hailey's great great great aunt. She was happy to join us. It had be over a year since she had seen Hailey and always asks granny how we are doing. We always joke with Hailey that she has SO many grandmas! Another granny pictured below with Hailey is actually Josh's mom's brother's wife's mom. Did you follow that? Big snuggles and smiles for granny! LOVE! The baby of the cousins below getting a huge hug from Hailey. At least one of them is enjoying this hug! LOL! Hailey and her love for babies. What a good sport. Having all these kids around really inspired Hailey to be like them. They were running around, going up and down the steps, leaning over petting fish. All things Hailey can't do but wanted to. There would be times when I'd hold Hailey up in front of me and she'd bare weight on her legs and she'd say, "let me go!" "I do it myself!" and I would think, "how do I tell her that she can't?" I would tell her get her balance and I would let go but be right by her. Little by little I could let go and Hailey would be standing by herself. She'd get to the point where she was standing for 10-15 seconds at a time! AMAZING!! She'd smile and laugh. She was getting to the point where doing this was wearing her out. She'd be tired and a spasm would kick in and knock her down but she was doing it. Everyone would comment on how much they never realized how tall she was. Well she was horizontal for over 8 months then only crawling you don't notice those things. Once she was upright it was a different world. Our girl is a FIGHTER! On a very sad note. 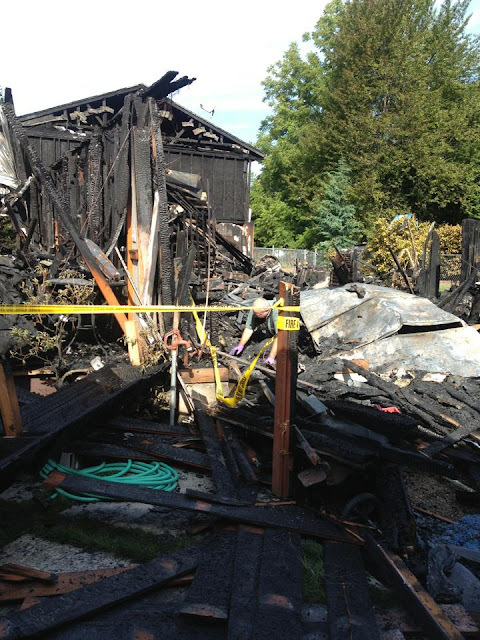 On Tuesday August 20th a fire destroyed a part of Josh's Uncle and Aunts backyard. There was a lot that was destroyed and now that picture that was taken with Haiey and Granny in the backyard was probably the last photo that was taken before the fire destroyed it. It was a very sad day to hear about this horrible fire. Josh's cousin took the picture below that shows the extreme damage done. Even though we are far away we want Josh's Aunt and Uncle to know that we are there for them and if there is anything we can do we will! On a good note. No one was hurt and their house that was just feet away was spared with minor damage.